Home theater audio systems come in all shapes and sizes, though few options are as convenient and no-fuss as a soundbase. Designed to sit right under your TV like a pedestal stand, soundbases usually consist of just one beefy audio unit with a few connections -- offering an even simpler alternative to many sound bar systems that come with separate subwoofers. But can such a space-saving and straightforward speaker really offer the kind of audio quality that a true film fan or TV lover needs? Well, the Fluance AB40 certainly makes a great case for itself. Though the device lacks many of the more advanced features found on more expensive next-gen audio gear, the affordable and convenient all-in-one speaker system just might be one of the best sounding models in its class. The AB40 is a 2-channel soundbase system with an attractive black wood cabinet and metal non-removable grill covering the front driver-array. The device measures 3.9 x 26 x 14-inches and weighs a sturdy yet very manageable 24 lbs., offering support for flat panel TVs up to 65-inches and 150 lbs. On that note, the 40-inch Samsung LCD I used for this review fit very nicely atop the unit with about 1.5-inches of the TV's own pedestal stand hanging off the left and right side of the base. With that said, some modern TV stand designs with feet on each side -- looking at you, VIZIO -- probably won't be able to rest on a soundbase like this. In addition to the speaker itself, the package also includes a Remote Control, Power Adapter, 6ft Optical Cable, Quick Start Guide, and a 1-Year Manufacturer's Warranty. The remote includes a simple button interface with controls for power, volume, playback, source, Bluetooth, and buttons for toggling the 3D sound option, standard mode, and bass boost mode. Under the hood, the system features an integrated 90W amplifier, dual 1" high-performance tweeters and four 3" aluminum drivers angled at 35º to help create a wider soundstage. On the back of the soundbase, the device features a Digital Toslink Optical input, 3.5mm stereo AUX input, and power connections. Meanwhile, the top of the system has a capacitive touch sensitive panel with buttons for power, source, and volume. Finally, the front panel behind the grill features an LED light between the drivers that can change colors to indicate different sources: white for optical, green for AUX, and blue for Bluetooth. Likewise, the light will flash twice when an audio mode is toggled and once when toggled off. The light also flashes when volume adjustments are made. And while this system works well enough, a text display or on-screen interface would have been ideal. As it stands, there's no way to determine what the exact volume level is set to and it would be nice to actually see a more specific and lasting visual confirmation that certain audio modes are on. For testing purposes, I used the AB40 with a Samsung Ultra HD TV connected via optical digital cable. It should also be noted, however, that the TV's output had to be switched to PCM as the speaker does not have any internal Dolby or DTS decoding (when the TV was left in Dolby Digital output mode, no sound played). Unfortunately, the soundbase does not include any HDMI connections of its own or video passthrough support, and the single optical and AUX connections might be a little limiting for some users. With that said, a PS3 and Roku 3 were also connected directly to my TV through HDMI, and the display was able to send both audio signals to the soundbase through the TV's optical out with no problems, allowing more connections to the AB40 beyond it own ports. After connecting a display or media player, there really isn't any additional setup to speak of. No subwoofer to pair. No calibration microphone. There are a few audio modes (more on them below), but in general, you just turn it on and start playing content -- resulting in a simple plug-and-play experience. To evaluate the device's audio performance, I watched a wide array of Blu-ray titles from my PS3 and streaming content from my Roku and Smart TV apps, including The Avengers, Inception, Game of Thrones, Hidden Figures, The Leftovers, Master of None, Better Call Saul, Gilmore Girls, and... uh... Fifty Shades Darker (my girlfriend made me, I swear). Likewise, I sampled several clips from Dolby and DTS demo discs. And though the soundbase's default stereo mode was rather impressive on its own, I ended up listening to most material with the system's 3D virtual surround sound mode activated as well. This feature offered a subtle yet very effective expansion of the soundfield, bringing a bit more space to ambient effects and music. It never actually seemed like audio was coming from behind, mind you, but the effect definitely widened the scope and depth of tracks without introducing any unwanted or artificial distortions. With that in mind, the AB40 demonstrated excellent range and versatility, handling explosive action and quieter moments with equal skill. Bass heavy scenes from Inception and The Avengers brought some deep rumbles to my relatively small living room, layering some appropriate heft with every bullet, car crash, laser blast, and hammer thud. LFE was never as robust and defined as a dedicated home theater subwoofer, but the low-end was surprisingly full while being leaps and bounds better than standalone sound bar systems that don't include separate subs. Highs and mids were also nicely rendered with no egregious issues, resulting in a nicely balanced sonic profile that veered slightly toward the warm end. Likewise, separation and imaging were great with the 3D mode enabled, spreading effects far off to the left and right when called for -- belying the soundbase's ostensibly constrained width. This was especially pronounced in a DTS demo clip titled Locked Up, which features a buzzing fly making its way around the listener. Dialogue, for the most part, was also emphasized well with a clean and full quality, but there were a few instances when speech seemed to get swallowed up a bit by background effects. On a similar note, some more aggressive clips, like one from Transformers: Age of Extinction, sounded a little cluttered, lacking the fine detail and nuance larger, separate speakers would bring. With that in mind, it would have been nice for Fluance to include some bass and treble adjustments, but sadly there are no settings for fine tuning here. Instead, the only other playback option presented is a Bass Boost mode, and I found this feature to be too harsh and exaggerated to be of much use (when the opening theme song to Gilmore Girls causes your table to vibrate, you know something is a little off). Thankfully, the standard mode with 3D enabled is balanced extremely well for most content on its own, so this is a fairly forgivable shortcoming. Finally, I also tested some streaming music tracks, both from Smart TV apps and through Bluetooth from my Android smartphone, including songs from Radiohead, Norah Jones, Gnarls Barkley, Arcade Fire, Pink Floyd, and more. As with my movie testing, music performance was also quite strong, with a pleasingly balanced profile free from any egregious brightness on the high-end or muddiness on the low-end marked by full vocals and distinct instrumentals. Stereo imaging was also good, especially considering the unit's size, spreading instruments and effects, like the cash register/change noise in Pink Floyd's "Money" to the left and right. 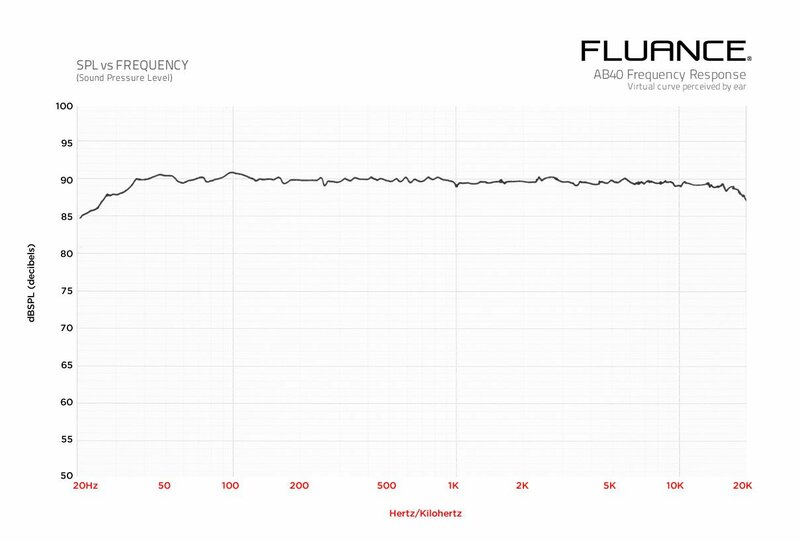 As a simple, all-in-one audio solution for users who want an upgrade from their integrated TV speakers, but who don't want the expense or hassle of a surround sound system, the Fluance AB40 offers strong audio performance for its price range -- besting many other soundbase or sound bar units in this class. With that simplicity and affordable price point, however, does come the loss of more advanced features like HDMI connections with video passthrough, integrated Dolby/DTS decoding, Dolby Atmos, a text LED display, or even bass/treble adjustments. Instead, this really is about as plug-and-play as a home theater solution gets nowadays. If all you're looking for is a strong 2-channel soundbase with a solid virtual surround mode to slide under your TV, switch on, and forget about -- then the Fluance AB40 is definitely one of the top models you'll find in the $250 price range. Just make sure to leave bass boost off when watching Gilmore Girls. You don't want to piss off the neighbors. Recommended.